Halfway through the summer, I gave into temptation and bought a new packet of seeds for the vegetable garden. (Like I really needed more seeds—we had so many left over from our order last winter that I have enough to start the entire garden next year.) Right around the time our first carrot row emptied out, I happened to spot some Italian Borlotti beans at the garden center down the road. I had to have them. I’ve always wanted to grow shell beans. I think it’s the whole popping-them-out-of-the-pod thing. It seems so peaceful to me—an activity you definitely have to slow down to enjoy. But these particular shell beans are special. First off, they’re pink. I’m not kidding—my favorite color. 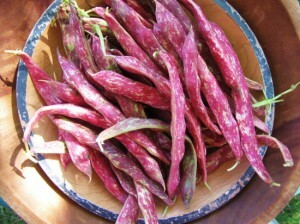 The crimson pods and the magenta-dappled beans are way too charming to pass up. 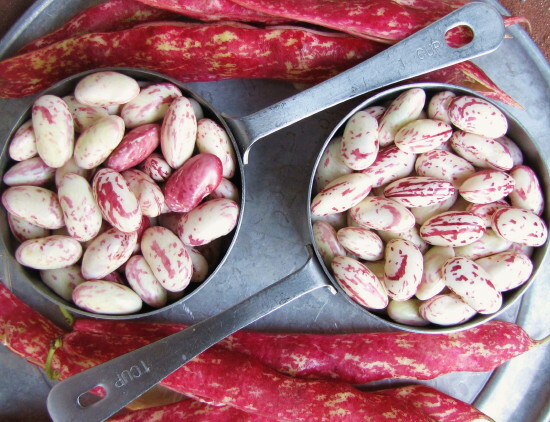 Secondly (and yeah, a bit more importantly), Borlotti beans (usually called Cranberry beans in the States) are delicious. 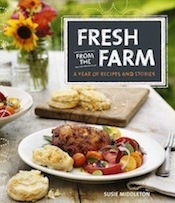 Cooked fresh, their creamy, meaty texture is like no dried or canned bean you’ve ever eaten. The only bummer thing is that they lose that beautiful color when cooked. Because I planted my Borlotti beans late in the season, I didn’t expect much. In fact, after a little initial weeding to help the baby plants along, I kind of ignored them as summer waned and fall got busy. But every once in a while I’d catch a glimpse of pink among the weeds, and I discovered that the plants were producing lots of pods. As soon as the pods started plumping up, I’d zipper one open every time I visited the garden. I was trying to figure out when to harvest them. Were the beans ripe? They seemed big enough, but many of them also had a pale greenish hue—hardly white with pink spots. I couldn’t find any info on the internet, but I finally got my answer, almost by accident. I took a few pods home one day to photograph, and as I was lining them up on the patio, I noticed that even though all the pods were predominantly pink, some of them were mottled with green, some with white. 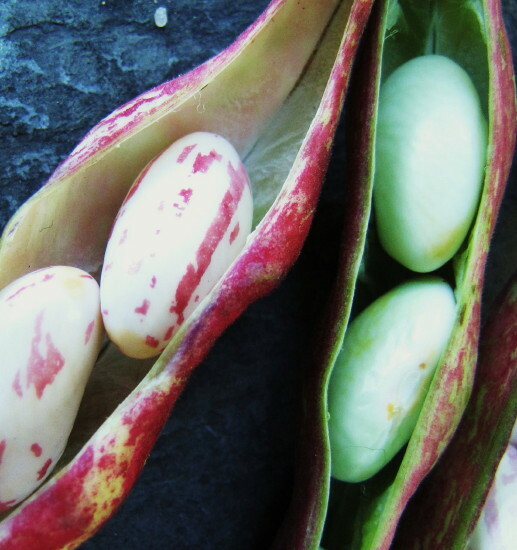 The pods that had the most white—almost the color of candy canes—had the nice white and magenta speckled ripe beans inside. The pods that had a mottled green background color still had the greenish beans inside. And there were gradations along the way; it seems the pods gradually change color as the beans ripen. At last, I’d finally figured out a way to tell if the beans were ripe without having to pick the pod and open it up first. Saturday Roy and Libby and I pulled up most of the Borlotti bean plants. We were in a rush, trying to get some tidying done in the garden before heading to the Bronx Sunday morning for a book signing I’d been asked to do at The New York Botanical Garden’s Edible Garden event. So I snipped the pods off the plants, stuffed them in a bucket, and crammed them into the fridge at home. Depending on where you live, you may still see the fresh beans at farmers’ markets or natural food stores this fall. 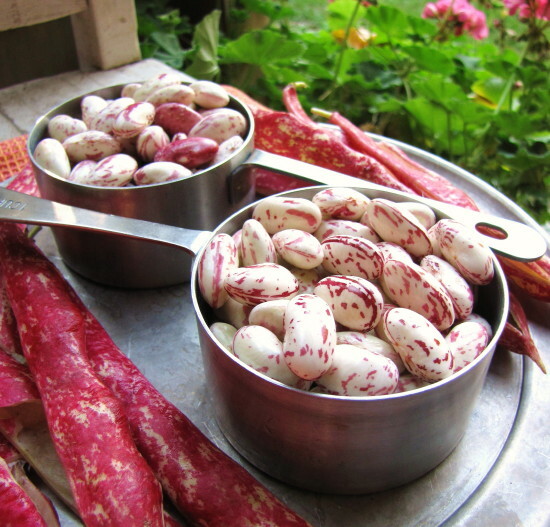 But even if you don’t get a chance to cook them fresh this year, keep an eye out for dried Borlotti (or Cranberry) beans. They’re a classic addition to all kinds of Italian soups and stews like Pasta Fagioli and Minestrone. For a light supper, serve these beans with a warm escarole, spinach, or arugula salad and some crusty bread. If you have pancetta (Italian bacon), it would be a more authentic substitute for bacon, so feel free to use it. 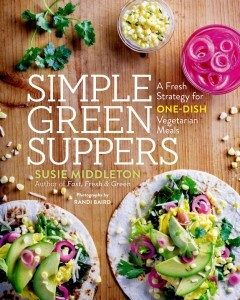 And if you want to go meatless altogether, no worries. The beans are still full of flavor cooked with just the rosemary and garlic and without the meat. 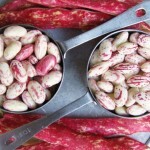 Transfer the beans with a slotted spoon to a bowl, and reserve the saucepan of cooking liquid. Remove the garlic and rosemary leaves from the beans. In a medium heavy nonstick skillet, cook the bacon or pancetta over medium-low heat until the bacon is crisp, about 12 minutes. Transfer the bacon to paper towels to drain. Turn the heat to medium and add 1 Tbs. of extra-virgin olive oil to the skillet. Serves 3 to 4 as a side dish. Oh yum. I remember finding these beans fresh in a grocery store last summer. They were divine. Now you’ve reminded me I’m going to have to go out and source some seeds. Yay! I wish I had an Italian Grandmother…but then again, my grandmother was a great cook–seat of the pants, that kind of thing. Hope you can get the beans. These beans are very versatile, and not just for Italians… For example, the farmer’s market in Roseville, CA (Denio’s) sells them to their largely Hispanic customers. Why? Because they’re creamier and tastier than the standard pinto beans in Mexican food. Just cook them in water only, adding salt 30 minutes before they’re done. One other comment: Unless you have freshly shelled cranberry / borsotti beans, it’s unlikely 20 minutes will be enough time to cook them. The dried beans take several hours. Thanks for this info, and yes, the recipe I’ve included here is (as stated) for fresh cranberry beans, not dried!